Eddy is a Naturalist Guide at Knight Inlet Lodge, British Columbia. He is an avid blogger about wildlife, Canada and wilderness exploration: see his brilliant work here www.edwardsavage.com. He is a greta friend and has wonderful sense of the natural world and how to communicate this to all the guests he meets. I’m really grateful he agreed to contribute his story, which is also closely intwined with Gary who we have met before. Enjoy. In 2013, I started working as a Grizzly Bear Viewing Guide at Knight Inlet Lodge on Glendale Cove, British Columbia. Over the course of the 5 month viewing season, I had my fair share of close encounters with grizzly bears. Sometimes I would get a visit from a grizzly bear while slowly driving down the road to our viewing stands and boardwalk trail, or sometimes I would meet them in the forest, on foot. 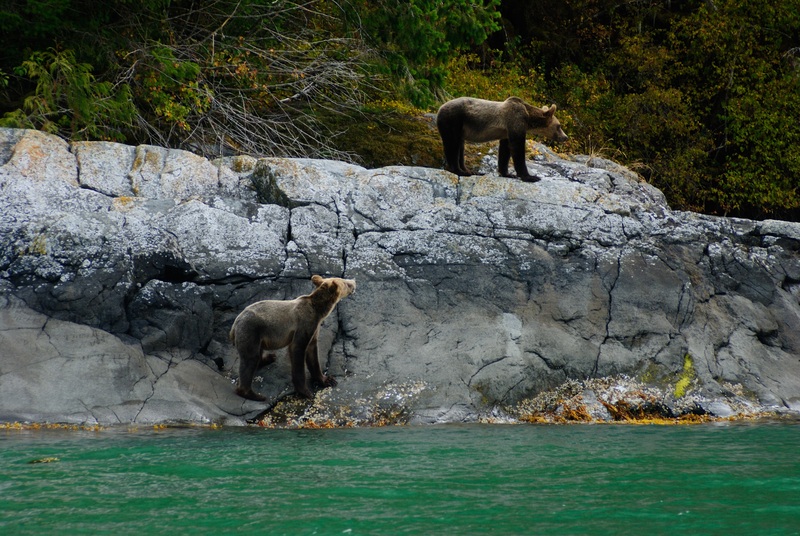 The researchers at Knight Inlet Lodge estimate there are roughly 10-15 grizzly bears who call the Glendale Cove area their home for up to 6 months a year and all of the naturalist guides at the lodge are familiar with these grizzly individuals. Despite there being many different bears in the area, I always seemed to come across one bear more often than any other: Gary. 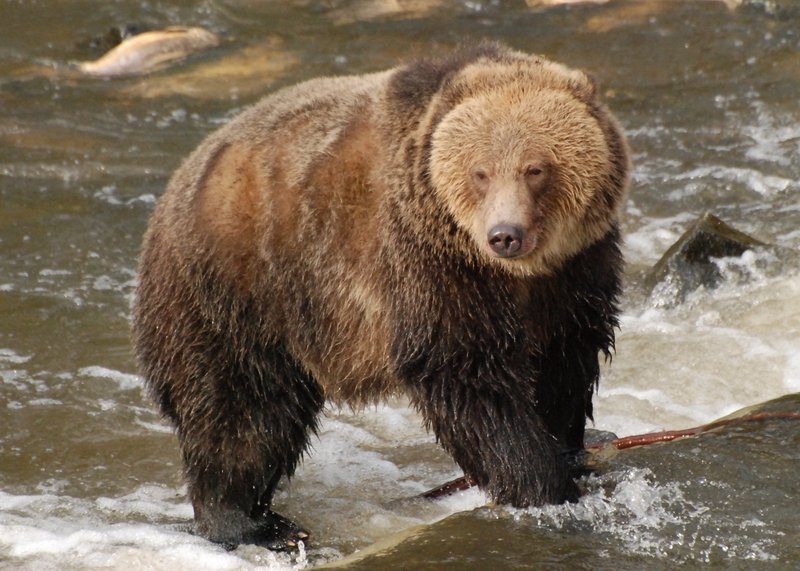 Gary is a male sub-adult grizzly bear who, to date, has spent the majority of his life foraging the shores of Glendale Cove and feasting on the Pink and Coho Salmon of Glendale Creek. Raised here by his mother Shaniqua and alongside his brothers Harry and Steve, Gary has been documented by researchers and guides since he was a few months old and no more than 20 kilograms. After two seasons of being shown how to forage and fish by his mother, Gary is now frolicking through the forests on his lonesome and has a knack for running into my tour groups. On an overcast and damp day in late June, I had my first run-in with Gary. I was accompanying John Kitchin, Naturalist Guide and Researcher at Knight Inlet Lodge, on a tour that had us exploring some trails along the western side of Glendale Cove. After spending an hour entertaining and educating our guests by finding paw prints, marking trees, and other grizzly bear evidence, we were heading back to the lodge for a hard-earned dinner. However, while organizing the transportation back to the lodge, Gary and his two brothers decided to pay us a visit. Meandering their way up from the shoreline, the trio of sub-adult grizzly bears appeared curious about their bipedal company. They crossed our path no more than 20 meters away and each grizzly bear spent a good amount of time studying their strange visitors. Gary spent the most time staring and sniffing at us. He even took a couple steps towards us but was greeted with the gentle yet firm voices of John and myself. After determining we weren’t a threat or food, Gary and his brothers disappeared into the berry bushes and let us be on our way. Being the first on-land grizzly bear encounter I have had, the experience was both frightening and exhilarating. Grizzly bears travel through many of the same areas that we travel and crossing paths with a bear or two while on the road or near our parking area (where the forest is most open) is a fairly regular occurrence. It is a much rarer and intimidating experience to meet a grizzly bear on one of the shared bear/human trails around Glendale Cove. In 5 months of full-time guiding, I only met one bear face-to-face on the trail systems. If you were guessing it was Gary, you are correct. On a gloomy August afternoon, my guests, a young family from England, and I were hovering over an Amabilis Fir (commonly known as a Pacific Silver Fir) that was overlooking the Glendale Creek. This tree is known as a “Marking Tree” or “Rub Tree” by guides and researchers because grizzly bears (primarily males) rub their bodies on it to communicate with each other. We were examining small clumps of grizzly bear fir stuck in some sap that was leftover from grizzly bears rubbing themselves on the tree. I was mid-sentence when the Father in my group interrupted me and, with a tight voice, mentioned there was a bear coming up the trail towards us. At first, because of his impressively calm demeanour, I didn’t believe my guest. I looked down the trail to where he was pointing and to my disbelief there was a grizzly bear lumbering towards us and I could tell immediately that it was Gary. I instructed my guests to spread out wide, not to run or scream, and to follow my instructions. Speaking calmly in the direction of the bear, I made sure I was loud enough and firm enough Gary knew what we were. Looking up from his somber, Gary noticed us and swiftly changed his path. He marched down the riverbank and crossed the river out of sight. Just as quickly as he appeared, he was gone. Over the course of the season I had a few more encounters with Gary but none as impressive or nerve-wracking as meeting him up close on the trail. Throughout the summer, I have developed a deep respect for the brown bear sub-species and I am excited to spend another season working alongside the charismatic coastal grizzly bears of British Columbia. The researchers and guides at Knight Inlet Lodge have given the grizzly bears that frequent the area human-names for record keeping and research purposes. We do not name them as pets, but as recognizable individuals distinguishable by unique colourations and features.